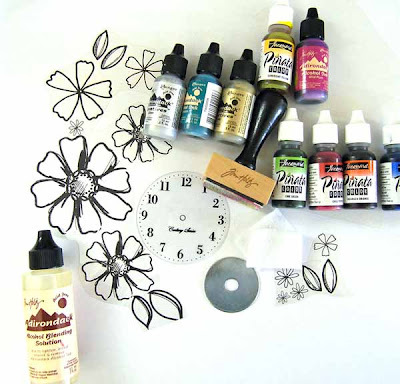 For some reason, many crafters shy away from alcohol inks. Could it be their very official sounding name? (insert very deep voice here).....ALCOHOL INKS!!! Could it be that they are little bottles filled with a liquid that looks like it would probably ruin any carpet that it touched? Whatever the reason, these little bottles of ink are really fun and have loads of amazing applications. They are well worth getting over the initial anxiety, I promise. 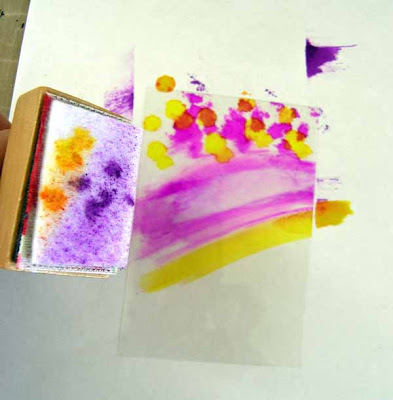 Before we begin, let's chat a bit about the properties of alcohol inks. 1. They can be used on slick surfaces like transparencies, glossy paper, acrylic, metal, foil, glass, and shrink plastic. 2. They are transparent and dry very quickly. 4. They come in many different colors that can be mixed to make even more colors. They also come in gold and silver to add a metallic sheen. 5. They can be blended (or used like a paint) using Blending Solution. Let's experiment a bit. Here are the supplies that I gathered from my studio. 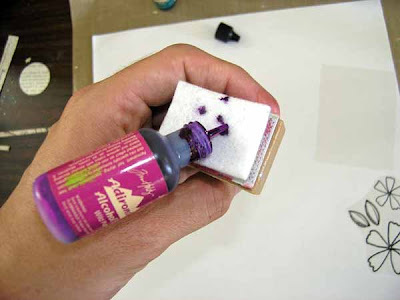 The most basic application is to drip a few drops of your favorite color onto one of the felt pads that you've placed on the bottom of the applicator. You can get really crazy and add a few colors like I did here. As you can see in the picture above, there are two ways to use the applicator: as a dabber and as a swoosher. At the top of the transparency, I dabbed. At the bottom, I made a broad swoosh. Once you've applied your initial ink, you can go back and add more colors. No need to change the felt pad. Here I've added some blue that mixed with the green and purple. 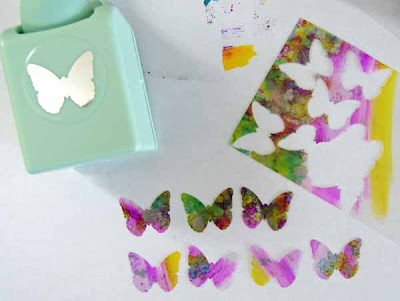 Once my transparency dried (only seconds) I punched out butterflies. 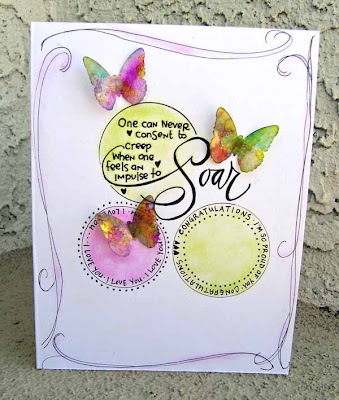 I used those butterflies to make this card. Once you've mastered the dabble and the swoosh, you can move onto slightly more advanced techniques that involve the Blending Solution. Working relatively speedily because the inks dry quickly, place a drop of alcohol ink and a few drops of Blending Solution onto your palette (I used the metal lid from a frozen juice container). 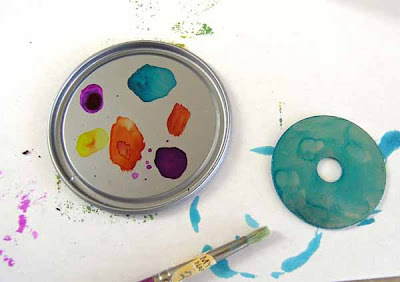 Using a paint brush, mix the two and paint onto a transparency. I did a little experiment because initially, I wasn't convinced that the Blending Solution was important. You can see my results in the picture below. The pretty blue flower on the left was painted with a mix of Blending Solution and alcohol ink. 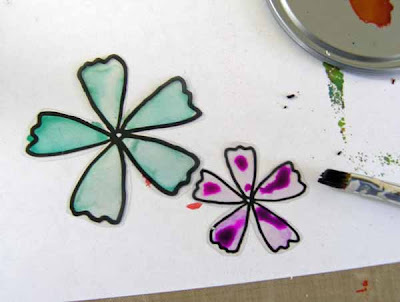 The sad purple flower was painted with a mix of water and alcohol ink. I guess that Blending Solution really is critical after all. 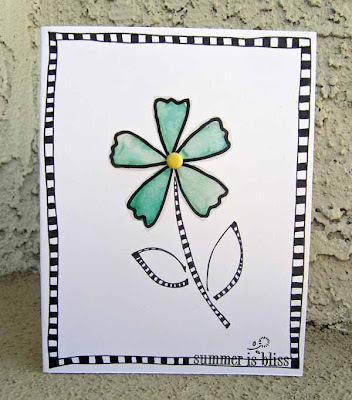 I used my blue flower to make this card. I adhered it using inexpensive Mod Podge. 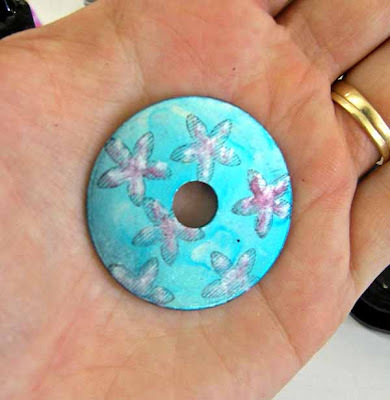 Although glue dots and Glossy Accents would work just as well. Now that we've mastered transparencies, we can move into metal. Here I painted a large washer using the same technique as I did for the blue flower above. 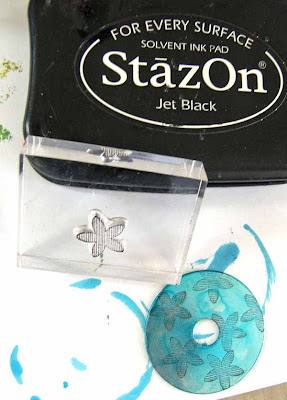 After the ink dried, I stamped using black StazOn and a Fontwerks flower stamp. Working quickly, I painted the flowers using pink and silver ink and Blending Solution. 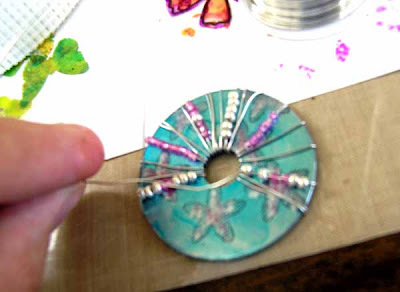 I wrapped a thin gauge wire strung at various intervals with seed beads around the washer to make a pendant. 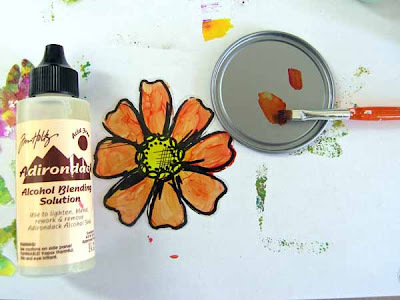 I hope this tutorial has encouraged you to overcome your alcohol ink anxiety and to experiment with this exciting product! What do YOU think? I'd love to hear of your escapades with alcohol inks! If you have any questions about the projects, please leave a comment here and I will answer them in a follow-up article. 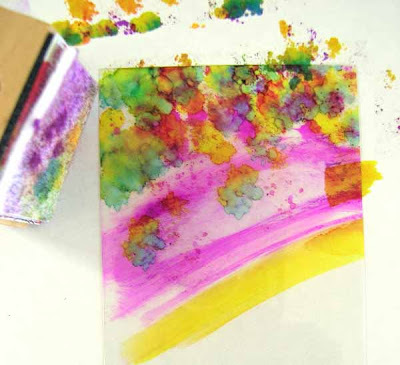 Thank you for this great article on alcohol inks. I love them but don't use them alot. I will have to get them out and try your techniques. I really love the butterflies and the cool necklace! Great projects! I have alcohol inks but just dont use them like I should. I like the transperancie idea. I need to get me some STaz-on ink so I can stamp on plastics. I want to try this technique. thanks for the inspiration. I too have gotten out of the habit of using them. Thanks for the refresher. Wonderful technique and love your projects, Beth!! I'm so ready to make one of those pendants!! Thanks a lot,Bethany for the wonderful article and project ideas. Alcohol inks is sure on my wish list. Love to give it a try. This is a great tutorial! I really liked your ideas about using them as a paint. I have to admit that I am one that has been "afraid" of them, but you make it look easy. Thanks! very cool tutorial! I've been afraid of trying these but I think I might give them a go now! A few years ago at CKU, I took a class from Ranger on alcohol inks. We did some things w/ photo paper, metal letters, and acrylic pieces, and it was fun. Sadly, I haven't used my inks very much at all. The last time I used them, I just changed a metallic silver accent into a red one...and oh, I used them to change some polished coat hooks we were putting up in our house - made them a little more rustic to match our better! Thanks for these ideas. I love the butterfly/transparency idea and will use it. 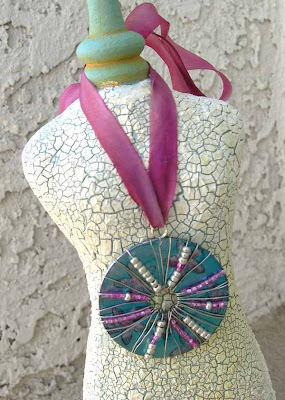 Your necklace turned out beautifully too! So cute!! I have been wanting to know how these work. I'd like to use them with Mod Podge. . .
Gorgeous, thank you!!! I love finding new ideas for alcohol inks, I don't use mine either!!!!! You're so right... I AM a bit affraid of my alcohol inks... I have 3 amazing colours (and the blending solution) and affraid to work with it. Thanks for the tutorial, I think you just gave me the last push I needed to finally start working with it!!! Thanks for this wonderdul tutorial. I like how you explain everything in details and that really helped me unstand how it works! It's on my must-try list now! Thanks for the inspiration! I never thought to paint the design... silly me! Your entry today really got my mind working (highly unusual). So I played around and plain ole rubbing alcohol does a very good job of blending the inks! Thanks for the link. Excellent info for a beginner like moi. How did you keep the inks from spreading uncontrollably and retaining a form, as in the blue flower? Thanks for your samples and tutorials. I'm trying to learn more about alcohol inks and your advice is great!